Oh Hey, a Virtual Console Game! Remember Those? Back in late 2006 we were convinced that one day our Wiis would be filled with every classic video game we ever wanted, thanks to the magic of the Virtual Console. That dream is dead now, but the Virtual Console continues to hang-on in superlative fashion. 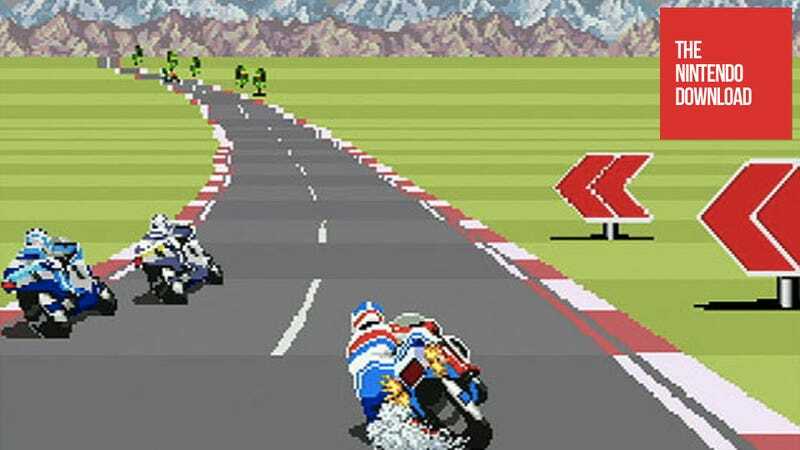 Today on the Wii Virtual Console it's Super Hang-On, the arcade motorcycle racer from the company that makes me want to keep typing 'virtua' instead of 'virtual'. You might recall this Sega classic as the one with the awesome motorcycle you'd sit on in the arcade. Well now you can play it on your Wii. Park a motorcycle in your living room, it can only help. Along with Super-Hang On, this week sees some sort of 3D bird game for the eShop and the DSiWare release of Amoebattle, previously a Kotaku Gaming App of the Day. It's funny. I'm tempted to pick up Super Hang-On for nostalgia's sake, but it's nostalgia over the Virtual Console and not the game itself. Battle for 'Primordial Soup'-remacy! A mysterious infection threatens the microscopic world and its inhabitants, and it's up to you – and your group of loveable single-celled creatures – to stop it from spreading. Built from the ground up, Amoebattle delivers a portable twist to the real time strategy genre and brings the experience to the palm of your hand. Intuitively command your troops using the Touch Screen as you discover interesting types of amoebas, journey through fantastic environments, and lead your amoebas to victory in battle…Amoebattle! When Mojo realizes his friends from the flock set out to Africa he begins a frantic chase after them because he wants to go on a vacation too. Fly faster and faster, dash, soar, glide, and collect all bonuses. How far can you get in pursuit of a delightful vacation? Bird Mania 3D is a skill-based action game where you steer a little birdy on his way to Africa. Keep him out of trouble as long as possible and beat your best score! You will be hypnotized for long hours while trying to collect all bonuses and avoid obstacles. And if you really want to perfect the art of flying, try to get all achievements. Gear up for ultimate speed in Super Hang-On. Based on the hit arcade racer originally released in 1987, this sequel to SEGA's Hang-On will put your street bike skills to the test. Tour through 48 challenging tracks on four continents and discover the rush of true arcade game play as you blaze through checkpoints in a race to beat the clock and your competitors. Experience the thrill of street bike racing and earn your place at the top of the scoreboards in this must-have classic.